Jaco is a beach town located on the Pacific coast with an abundance of activities, hotels, bars, restaurants and other accommodations that attracts people from all over the world. The hot weather, beautiful beaches and lush rainforests keep the tourists coming back. After vacationing in Costa Rica you will understand why it is voted the happiest country on earth. Juan Santamaria International Airport (SJO) is the busiest airport in Costa Rica and it was once the busiest airport in Central America but now only 2nd to Tocumen International Airport in Panama. If you are flying to Costa Rica then SJO is usually your best and most central choice for an airport. There is however an international airport in Liberia so if you have planned a vacation the Guanacaste Province then the Daniel Oduber Quirós International Airport (LIR) in Liberia would probably be your best bet. 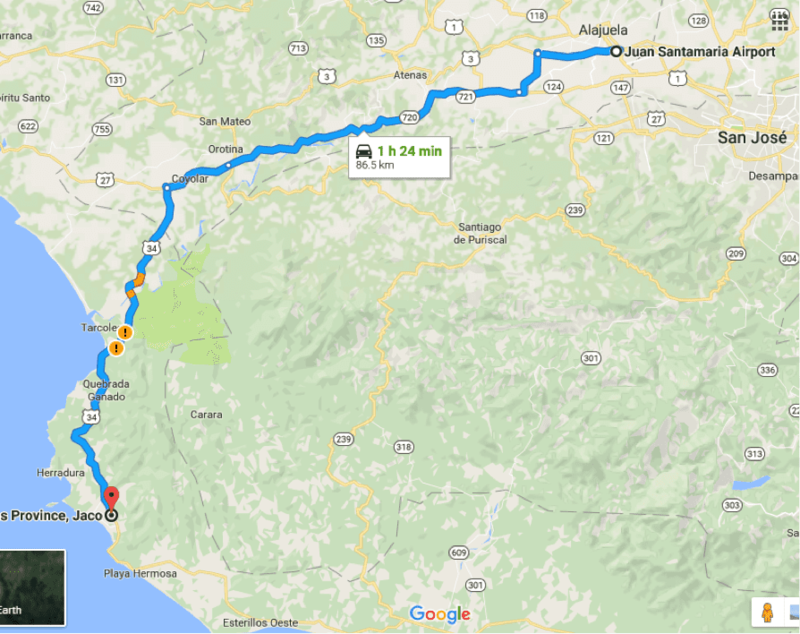 Costa Rica is a small country so it is best to check the prices for both airports if your final destination is central because you may save some money and only be faced with a little extra driving time. Most of the time the prices are pretty close but this always depends many variations like, departing airport, airline and time of year. If you are going to Jaco, Manuel Antonio or anywhere on the Caribbean side then SJO will be your best choice. When arriving from most popular countries like Canada, USA or the UK you will be permitted to stay for a maximum of 90 days with no prior visa permissions needed. Be sure to have your forms completely filled out and bring your own pen. You are supposed to have a ticket leaving the country with in the 90 days already purchased. Customs asks to see the ticket on occasion but usually only asks how many days you are staying, so if you don’t already have the ticket purchased be sure to give an answer that is less than 90 days to avoid any problems. If you are arriving in the country with no local currency then you will have a chance to change some of your currency upon arrival. The local currency is called Colones, the paper bills are conveniently waterproof. The money exchanges are located near the baggage claim. You may exchange cash or use your visa to obtain money, the rates are usually higher than average when exchanging money at any airport so it is best to make the exchange at a bank but you may need cash to pay for a taxi or bus. It is easy to get set up with a pay as you go phone upon arriving at the airport. Look for the booths that say Kolbi or Movistar, those are the two biggest and most reliable cellular companies in Costa Rica although the services are not great, you will most likely drop some calls even when you have full bars leaving you stumped. If your phone is unlocked for any provider then buying a local SIM card for the phone is cheap, around $2 and you will be surprised at how far $5 will go with pay as you go, beware that using data can eat up the money fast however. You may also buy a phone at the airport if you don’t have your phone unlocked. Using the GPS on the phone is a great way to avoid having to rent one from the rental car company. The airport does have free WIFI so you can always type in your location to the GPS to figure out a route. The security at most airports in the USA is much more extensive than at Juan Santamaria Airport. You do have to pass through a security screening when you arrive where they will scan your bags. If you are bringing goods that will stay in the country you will be expected to pay taxes. If this is the case the best tricks in the book to avoid taxes is to say that you are just passing through or that the goods are a gift. It is always recommended to pre-book a rental car in advance, this will save you hassle and you will get a better price, when you arrive at the airport without a booking they know that you are unprepared and usually try to capitalize on the situation which costs you money. The rental car booths are located just past the security screening and before going outside. Costa Rica does not have very good road signs so it is recommended to have a GPS on your phone or rent one from the rental car company. Below you will find a map with the fastest route to Jaco and the Pacific coast from the airport. The first thing you will see when you exit the airport is a taxi driver asking you if you need a taxi. Prices to Jaco start at around $100 but you can usually find someone for around $80. When negotiating, it’s usually best to just walk away if they don’t accept your offer, chances are they will come around or you will find someone for cheaper. As you walk out of the airport take a left on the road where the taxis are, going the opposite way of the car traffic flow. In about 50 meters you will reach the main road where you walk to the right, you will see the bus stop about 50 meters away. To get to Jaco you will need to take the bus in to down town San Jose. Be aware that mostly all the buses that come say San Jose on them but not all actually go to San Jose. Ask each bus driver as they arrive if they go to San Jose, por San Jose means for San Jose, they will either reply no or si (yes) Lots of the buses are headed to Alejuela which is not where you need to go. Buses come frequently, every 15 minutes or so. Once you get on the correct bus for San Jose get off at the very last stop. From there your best bet is to take a taxi to the 7-10 bus stop not far away. It is located at 10th street and 7th avenue, the taxi drivers will be familiar with the route which is only 5 minutes away by car costing about $3-$4 dollars (1500-2000 colones) Go to the second floor to by a bus ticket from Transportes Jaco, the ticket will cost around $5, buses leave every 1-2 hours depending on time and which days, more buses leave on the weekend. The entire trip is a bit of a nuisance and will take about 3-4 hours.